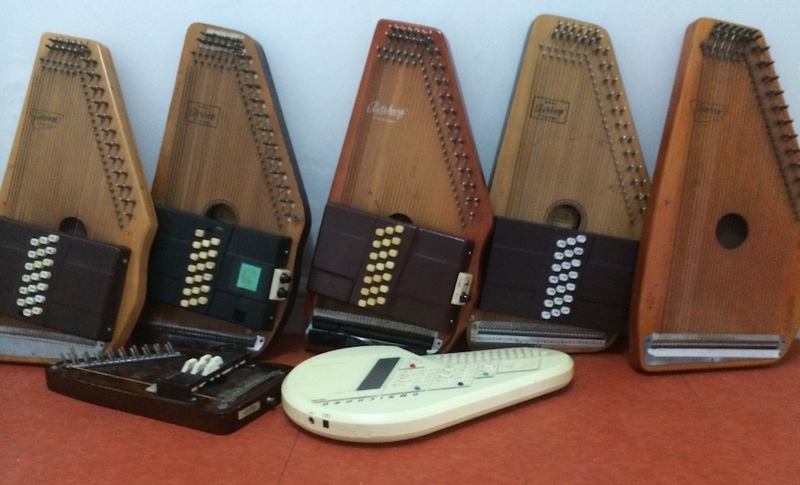 Ever since I started playing autoharps back in Nov '73, I have been fiddling with the tunings and the chord patterns. For some of these tunings., I can tune the harp to itself by means of a handy plastic template I made that slides under the strings. This template has harmonic points marked for each string (up to the 6th harmonic) which is a good way to check string ratios. Otherwise, I use my handy Yamaha DX7 synthesizer or computer generated tones. I started out with a 21-chord Oscar Schmidt Model C. 21 chords gives one lots of room for experimentation. Highest notes sharpened, lower ones flattened. Here is an example of modal tuning as applied to Jesu, Joy of Man's Desiring (3063K). Here is a tuning that I have on a little Chomoharp, a kid sized one with just 5 chords. F F C F G A A B! C D! Eb E F F G A B! C D! * means a half height felt is there. all the way down cuts it out. X X X X G X X B! X D! X E* X X G X B! X D! Now I'll give you a REAL headache: I have another 21 chord Schmidt that is set up to be tuned in a just intonation based on F, which has two kinds of Gs and two kinds of Bbs in it. Or in other words, a 5-limit just scale built on 3/2 (perfect fifth) and 5/4 (major third) and their inversions 4/3 (perfect fourth) and 8/5 (minor third). There are twelve tones in this scale, although they are not equally tempered. The first trick is to retune the strings to this new scale. The second trick is to pick chords that make use of this scale. You may have noticed that some of the tones are "out of order" - this was a relic of an earlier scheme involving a 19-tone tuning... but I digress! One of the interesting properties of the chords I ended up with is that each one has an F and a C in it (!) which allows me to put in two drone strings at spot #6 and #12 tuned an octave higher than normal. For this, I use a thinner guitar string. Sometimes I insert in a crude bridge to pull the string up above the thicker strings it's near, which makes it easier to pluck and often gives it a different, more muted timbre. That makes 19 chords: 7+7+3+2. There's room for two "lock bars, but I only made one (F). even when you aren't pressing it. All the chords have the drone strings open in them as well. How are these bars arranged? These chords are so rich, you can easily mistake them for one another! In practice, I usually put the "9th" of the chord only in the top octave so that there's not too much going on in the bass! Also, pressing combinations of chords tames them considerably. The lock bar lets me do a diatonic run in F and also helps deaden the non-F diatonic strings, as the felts on these bars are pretty beat up by now. Clearly, close inspection shows that some of the chord choices could be tinkered with - some chords would benefit from using G' for G and vice versa, for example. Here's a video about this Pentad tuning, made on Dec 26, 2013. Just click the "play" control (ignore that loading... message if you see it; it will load then). 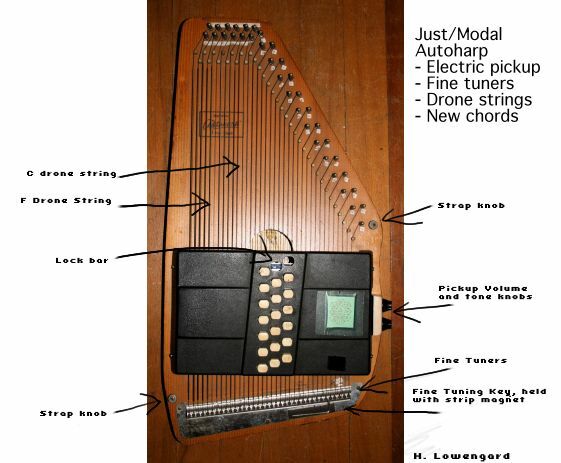 Todd Crowley has a tuning system called "Prizim Zither", a chord system that lets you play a lot of dense chords if you are willing to push two buttons at a time. Many of those note names are mere approximations to the true harmonic note... but anyway, you can beat the harp with a stick or your hand, strum it, pluck it. In a resonant space, it's quite something. Here is an MP3 of it(306K). And then I cut three diatonic sets of 7 chords apiece. These chords are nominally triads, but use the "half felt" trick to add the fourth note in the top and middle octaves. You get tetrads unless you press the bar down harder. I also used foam mounting tape to get the chords closer to the strings, which makes it easier to play. So it's a lot cleaner sounding, and has some good transitions. But not much in the circle of fifths! The chords are in the keys of D, F and Ab. Those who can multiply realize there are 21 chords there, but only space for 15. I swap parts of the sets out so I can hear what they are like. For a while, it was just F and Ab, like the Diatonic Pentad harp. Then it was D and F, which was great because I'm using the standard string schedule, and Ab basically has no bass that way. Another way is to take 4 chords from D, 7 from F and 4 from Ab. The chords I use are rich enough for substituting in most cases. It can also be organized as 5 chords x 3, IM, IIm, IIIm, V7, VIm for D, F and Ab, which is a little limiting, but can do some interesting things.